Today's a bright and sunny day, another perfect day for exploring! Ever since the little blue dragon had left his home, the Icewings' land for his own reasons, (Not because of OOC reasons) he had been tirelessly foraging the lands that has were still unclaimed by other dragons. It was quite an unusual sight for a little hatchling to be on his own in a territory he wasn't supposed to be in and for 3 days... But he wasn't on his own, he has a bird companion who is resting on his head now and his stick. A stick with some unusual markings on it, that counts as a companion right? Echo was sunning himself on top of a mountain before catching a flash of blue in the distance. What's that? he thought, and flew down to investigate. He landed on a cliff just above the shining object, and peered down at it. It was a hatchling. The hatchling had a stick, and on top of the stick... was a bird! How unusual. Hatchlings shouldn't be this far out in unclaimed territory. He decided to observe the hatchling, instead of confronting it. Echo knew that if dragons looked around, it was mostly side to side, not up. The color of the scales on his head would provide camouflage even if the hatchling happened to look up. Settling down, he started to watch the hatchling. Artemis stretched her wings. Today was colder than usual, she thought as a chilly wind nearly blew the bird off her head. "Careful, Gilbird," she said to the flustered yellow bird that had managed to stay on her head. Gilbird chirped crossly, as if to say, Can't we go home? The dragoness smiled, and shook her head. Her pet bird gave another cross chirp as she started walking, wondering if she would be able to find a place that she hadn't explored before today. Maybe not. Oh well. She'd just wander for fun, then. Then a flash of icy blue caught her attention, and she tilted her head back to look upwards. A hatchling stood on a cliff, glancing around, presumably looking out for danger. She stood there, watching him curiously, wondering what would happen next. As she observed him, she spotted a stick with odd markings on it, and a bird. So he had a pet bird, too. Echo continued to look down at the hatchling, relieved that he wasn't seen. He'd been sitting there for quite some time now, and was getting bored. He sat up, and scanned the land for prey. He wasn't going to sit here forever, that was for sure. Seeing a lone deer in a clearing not far away from where the hatchling was standing, he decided to hunt it. If the hatchling sees me, whatever. He shrugged. He stretched out his wings, flapped, and lifted off into the air. When he reached the perfect height, he snapped his wings by his side, and let himself fall headfirst, heading down in a kill spiral. The deer looked up one second before he sank his claws into it, and darted out of the way. Backwinging furiously, Echo roared and gave chase to the deer. It was obviously trying to use his big size against him, so he lifted up into the air once again. He could see flashes of the deer in the forest as he flew above it, until the deer dashed into the vertical wall of the cliff. 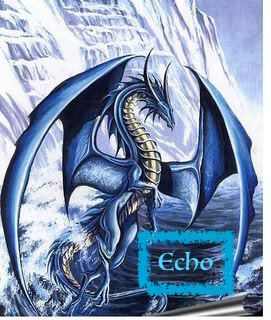 Echo landed behind it, cutting off all mean's of it's escape, leaving it quivering by the wall. The deer, seeing him come closer, turning around and kicking out at him. Echo chuckled to himself. This deer certainly wasn't giving up. Well, he wasn't going to wait much longer so he darted forwards and sank his claws into the deer's neck, killing it instantly. Content with his catch, he gulped it down in a few bites and lay down, drifting off into a noon nap. Artemis spotted a male rise from the snow and fly away. Also, there was a bird that the hatchling had sent to...see her? Yep, that was the most likely possibility. She spread her large, SkyWing-like wings and took into the air with the speed and grace of a cheetah running, and then landed beside the hatchling softly, hoping that she wouldn't scare him away. She liked hatchlings. "Hey," she greeted him. Her voice was as soft as the breeze's whisper. The dragoness curled her tail around her as she sat back on her haunches, watching beautiful snowflakes drift from the wintry sky. She reached out and caught it; she retracted her arm to admire the snowflake. It was unique, like all snowflakes; its pattern reminded her of an ice crystal. How beautiful. She folded her wings and waited for a response from the hatchling. Once again, i walked around Pyria because of the many adventures i would find, while trying not to go insane from Ender 2's logic (which is kill everything in sight, friendly or not.). And then we saw two Icewings, one hatchling and one with a bird on it's shoulder. Looks like a good time to practice my skills, right? They don't even know we are here. He tried to persuade me, but i refused and leaving him defeated. I walked over to there and did the best thing i could do. "Hello there, i hope i didn't interrupt anything." I greeted myself to the group, watching my step and keeping a certain split away. Artemis's head whipped around, and her tail rose into a scorpion stance instinctively. A NightWing. "What are you doing here?" she demanded. "Don't you know that NightWings aren't welcome here?" She shifted a little to make sure that the hatchling was safely behind her. Her claws dug deep into the snow, ready to take a blow from the stranger. If he attacked. She watched his every move, spikes on her back rising, like hackles. One wrong move and you're dead, NightWing, she thought. Welp, i just opened a huge bag of poisonous snakes and scorpions to what her reaction was. "Calm yourself down a little, i don't mean any harm. I was just wandering around- and i think whatever i say you still won't trust me, right?" I tired to say and then realised on her reaction to my being here. Now i think we are going to die, don't you agree? Ender 2 asked me in our mind, and i nodded in response to him again in our mind. His tone made the dragoness falter a little. "Of course not!" she responded anyway, her tone biting. "Which idiot would trust a dragon on sight? I've learned my lesson in a battle years ago to never trust a stranger. No matter how harmless they may seem. See this scar?" Artemis arched her head to the left, showing the vicious scars that ran down the right side of her neck. "A NightWing did this to me." When the ice dragoness flew upwards as a response to Kyuurei's birdy, the bird panicked as it thought it was going to harm his friend. The bird quickly flew back to the cliff where Kyuurei is but it couldn't reach him fast enough before the dragoness did. Once the bird had landed on Kyuurei's head, it was when the dragoness proved to them that she wasn't going to harm her, so the bird said nothing. Kyuurei was planning to go after the blue dragon who had took off into the sky and spiraled down to the ground once his bird has returned. But he was interrupted by another dragon, I guess that can wait a little longer, he thought. He was going to yap 'hi' to the icewing dragoness until a very dark scaled dragon came along, which somehow made the dragoness start a conversation with him. Kyuurei felt overwhelmed by this and it absolutely doesn't help at all that these dragons are HUGE compared to him and so, he ran off to where the higher parts of the mountains, looking for the dragon who did a spiraling attack. I knew as soon she said that a Nightwing did this to her, i would not be able to get out unschaded But it also brought up the past with Draco almost killing me and destroying our home. "Well i wouldn't lie to anyone, i do feel sorry for you, with one of my kind doing this. Even though i am a Nightwing, you don't always judge a book by it's cover." I tried to calm her down a little, but won't work to anyone that was scared by the very thing that is in front of them. I knew that feeling perfectly, with me finding Draco for the second time on Pyria. "I know, I know." Artemis turned her head away. "But...you don't know how it feels to have a friend, your closest friend, betray you." Her voice was bitter. She watched the hatchling hover some meters above her, presumably looking for the male that had gone down in a spiral, one that she was very familiar with, since she hunted every day. She gazed wistfully at the sky. Her tail lowered itself and curled around a haunch. At least she calmed down a little bit, but then said that her closest friend betray her is something i known quite a lot. "No, i do very much. Before i came to Pyria to let this be my home, i used to live on a place that was destroyed by a something. And during this, my blood-brother, for what we called each other, tried to murder me without second thought. I know what it feels like to see someone you held close to you try to stomp you into the ground like a spider. What i seen you can never unsee, or even try to forget and fail to. You have only gotten a shorthand of the betrayal, my home destroyed by someone or something, and my blood-brother almost killed me. And try to say that you don't think i know what betrayal is." I monologue, letting the memories flow by me, letting very few details out that wasn't modified to not let the truth out. No one must know of what happened on Eranthis, especially on how Draco killed everyone that lived there.